MLB.com's Jesse Sanchez is reporting that the Boston Red Sox have reached a deal to sign Cuban outfielder Rusney Castillo to a six-year, $72 million deal. Baseball is officially in the golden age of Cuban defectors. Castillo, a 27-year-old center fielder, is getting more money than any Cuban import has gotten before him. Yoenis Cespedes snagged a four-year, $36 million deal from the A's in 2012, Yasiel Puig got seven years and $42 million from the Dodgers that same year, and the White Sox threw six years and $68 million at Jose Abreu last offseason. The fact that these guys have turned out to be bargains—two of them are legitimate MVP candidates—easily explains why the Red Sox are so comfortable giving this much money to Castillo. Castillo doesn't exactly light up Clay Davenport's EqA metric, which attempts to project how players in foreign countries will perform in America. 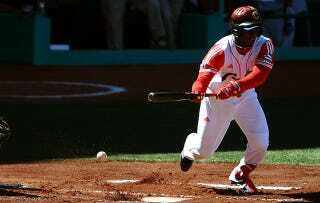 His 2012 season translates much like Puig's 2011 season in Cuba did, but Castillo is already four years older. Still, Castillo doesn't really need to be anything but average for the Red Sox's money to be well-spent, and given his age, he should be ready to plug right into the lineup by opening day of next year. Meanwhile, we should expect price tags on future defectors to continue getting bigger and bigger. Teams are getting elite production out of Cuban players at well-below market prices these days—even Alexei Ramirez, a guy whose name isn't going to curl anyone's toes, has been churning out three- and four-win seasons while making less than $10 million per year—and as more GMs start to catch on, the bids for these guys are going to rise. There's also the fact that most Cuban players, depending on their age and experience in Cuba's top league, are exempt from MLB's international bonus caps. All that television money teams are making has to go somewhere, and major league-caliber talent from Cuba is looking like a pretty damn good place.